1 of 3 Place peppers, cut side up in a large microwave-safe baking dish. Add 1/4 cup water and cover with plastic wrap, venting one corner. Microwave on HIGH power for 5 minutes until peppers are softened. 2 of 3 Prepare couscous mix following package directions. Stir in shrimp and scallions and allow to stand 5 minutes so shrimp is heated through. 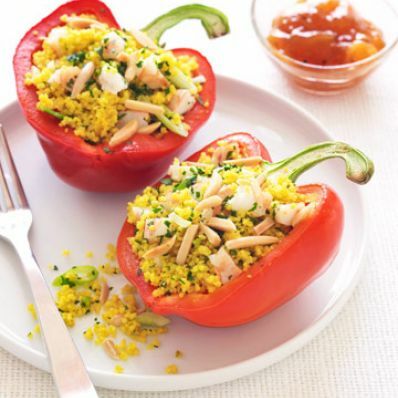 3 of 3 Fill each pepper with a generous 1/2 cup of the couscous mixture. Top with the almonds and sprinkle with parsley (if using). Serve chutney on the side.